URBAN ARMOR GEAR Folio iPad Pro 12.9-inch / 11-inch 2018 - Black..
Handcrafted, feather-light construction with 5 layers of protection with top grain leather & metal hardwareUAG Monarch iPhone cases are Apple Pay & wireless charging compatibleFeatures soft impact-resistant core & honeycomb traction gripUltra-responsive tactile buttons deliver a crisp, clean click-feel for improved functionality..
Handcrafted, feather-light construction with 5 layers of protection with top grain leather & metal hardwareCompatible with wireless charging. Not compatible with reverse wireless chargingFeatures soft impact-resistant core & honeycomb traction gripUltra-responsive tactile buttons deliver a crisp, clean click-feel for improved functionalityM..
Urban Armor Gear Monarch Series is built with quality materials consisting of 5 protective layers. 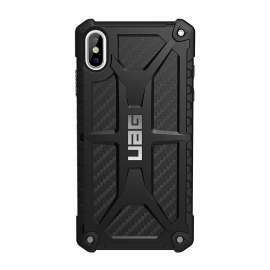 Starting with UAG's signature armor frame and shock-resistant core, layered with top-grain leather, a polycarbonate shear plate, and alloy metal hardware-all wrapped in impact-resistant rubber. Monarch cases feature upgraded side grips with honeycomb ..
Armor shell and impact resistant soft coreFeather-light composite constructionOversized tactile buttons & easy access to touchscreen and portsScratch resistant skid pads and screen surroundApple Pay compatible Wireless charging compatibleMeets military drop-test standards (MIL STD 810G 516.6)..
Feather-light cases feature our patented hard outer shell and soft impact resistant coreUAG Pathfinder iPhone cases are Apple Pay & wireless charging compatibleSoft raised rubber screen-lip and rear skid pads provide 360-degree protection for your iPhoneUltra-responsive tactile buttons deliver a crisp, clean click-feel for improved functionalit..
nspired by military armor, UAG (Urban Armor Gear) brings lightweight cases with military-grade shock protection, without adding the extra bulk. Their patented Composite design features a hard outer shell with a soft impact resistant core, guarding against sharp objects and drops. Shock absorbing bumpers are seamlessly integrated into the design to ..
Urban Armor Gear products reflect the independent spirit of our designers and represent a dedication to superior quality and craftsmanship. Our feather-light composite cases feature a hard-outer shell and a soft impact resistant core. Although visually striking, the unique shape of the case also provides strength while minimizing size and weight. O..
Feather-light cases feature our patented hard outer shell and soft impact resistant coreCompatible with wireless charging. Limited compatibility with reverse wireless charging. See product description for detailsSoft raised rubber screen-lip and rear skid pads provide 360-degree protectionUltra-responsive tactile buttons deliver a crisp, clean clic..
Feather-light cases feature our patented hard outer shell and soft impact resistant coreUAG Plasma iPhone cases are Apple Pay & wireless charging compatibleSoft raised rubber screen-lip and rear skid pads provide 360-degree protection for your iPhoneUltra-responsive tactile buttons deliver a crisp, clean click-feel for improved functionalityMee..
MONARCH Skillfully crafted with premium materials and a durable 5-layer construction to elevate your tech protection to the next level. PLASMA Go further with rugged protection fused with visually striking designs. ..
Feather-light cases feature a soft impact resistant core with air-soft corners for cushioning impact100% compatible with wireless charging and reverse wireless charging. See product description for more detailsOffers a dramatically thin, friction free, lint resistant package that easily slips in-and-out of pocketsUltra-responsive tactile buttons de.. 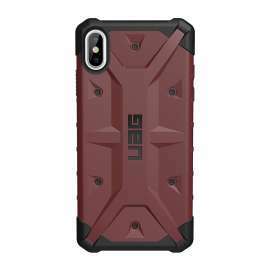 Rugged, Lightweight, MIL-SPEC Protection for the iPhone X Urban Armor Gear products reflect the independent spirit of our designers and represent a dedication to superior quality and craftsmanship. Our Metropolis case features a flip folio with a hidden compartment that holds up to two cards. Our design provides 360-degree pro.. Rugged, Lightweight, MIL-SPEC Protection for the iPhone X Urban Armor Gear products reflect the independent spirit of our designers and represent a dedication to superior quality and craftsmanship. Our feather-light cases feature a hard outer shell and a soft impact resistant core. Soft-raised rubber screen-lip and rear skid pads provid.. 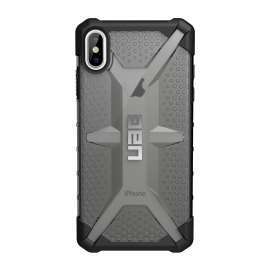 Rugged, Lightweight, MIL-SPEC Protection for the iPhone X Urban Armor Gear products reflect the independent spirit of our designers and represent a dedication to superior quality and craftsmanship. Introducing UAG’s newest series, the Plyo Series offers a sleek, translucent, minimalistic design. 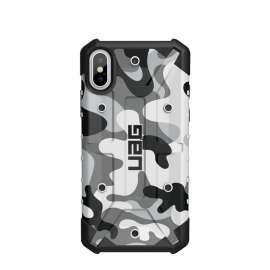 Our feather-light cases featu..
Feather-light cases feature our patented hard outer shell and soft impact resistant coreCompatible with wireless charging. Limited compatibility with reverse charging. See product description for more detailsSoft raised rubber screen-lip and rear skid pads provide 360-degree protectionUltra-responsive tactile buttons deliver a crisp, clean click-fe..
Feather-light cases feature a soft impact resistant core with air-soft corners for cushioning impact100% compatible with wireless charging and reverse wireless charging. See product description for detailsOffers a dramatically thin, friction free, lint resistant package that easily slips in-and-out of pocketsUltra-responsive tactile buttons deliver..